Shinsui, Ito (1898-1972) "Bijin at the Beach" - Hybrid lithograph (offset lithograph) - Chinese and Japanese woodblock prints for sale, silkscreen, scrolls, watercolor, lithographs. 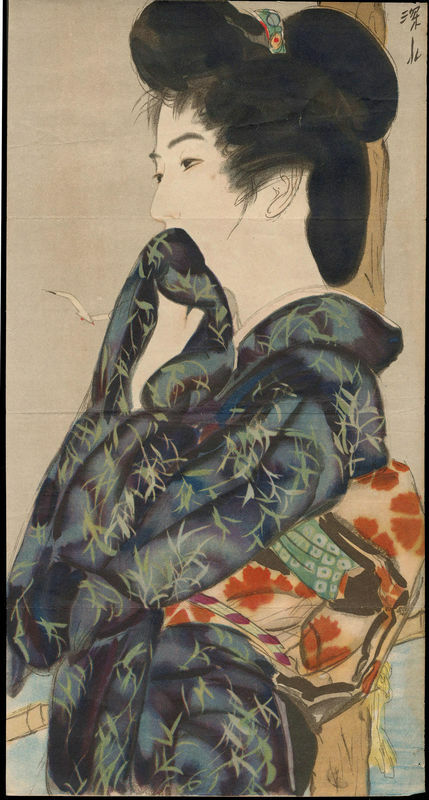 Artwork Details for Shinsui, Ito (1898-1972) "Bijin at the Beach"
Condition: Very good. A small 6mm tear at bottom right corner. A few handling creases mostly at the edges. A spot on the bijin's face. Usual kuchi-e folds. Notes: Rarely seen Taisho-era lithographic print. Very hard to find prints from this magazine series, even here in Japan. See my note on non-woodblock printed kuchi-e prints here.